"What a fantastic place! Perfect for Team Building whatever size group you have. For the last three years we have rented the whole site for our department Team Build. The main building, The Barn is something out of “Grand Designs”, with high beamed ceilings and open plan dining area. 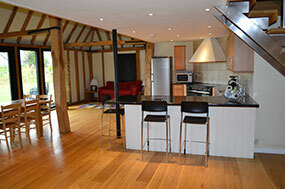 All the buildings, the Barn, the Oast and the two cottages are spacious, clean and come fully equipped. The heated swimming pool and tennis courts are great for creating a team event or just chilling and relaxing. There is plenty to do in the local area, Doddington Gardens, where you can be a falconer for an afternoon, or if you prefer horse riding there are local stables. The surrounding country side can be explored on foot or bikes, which are provided. The outdoor space is great for barbeques and parties in the summer and the Barn is spacious enough for those cooler days and evenings. Each year we talk about going somewhere different but always find ourselves returning to Great Higham. It is great value for money and we have not found anywhere else that can beat it. 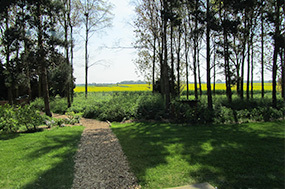 I would highly recommend Great Higham for all occasions, corporate or private." "What a fantastic place! So well set up and brilliantly welcoming. Our stay was fully of long walks, slow cooking, plenty of games (musical chairs around huge table was hilarious) and fantastic company. We all had a ball and plan to return, thank you so much everything." We came to stay to have fun, with hog roasts, hot tubs, walks, pub lunches, swimming, tennis and more food! A great time had by all with much merriment, thank you for a great location. What an incredible find! We came here with 33 friends for a big birthday bash and has such a fantastic time. The house was transformed on Saturday into an 80s bonanza and we loved every minute of it. The hot tub with a constant source of amusement. "When looking for a venue to house 30 people over a weekend it seemed the perfect place; it was! All the guests were very impressed with the barn and its facilities, which were beautifully laid out with space for everyone. The old-style beams were the perfect look for our Tudor themed fancy dress party which went ahead with great success. Thank you for providing a place that made my 40th birthday celebrations a time that would not be forgotten."